DR. EDWARD ALVAREZ IS A cosmetic and reconstructive DENTIST PRACTICING IN MIDTOWN MANHATTAN. PATIENTS FROM ACROSS NEW YORK CITY, LONG ISLAND, WESTCHESTER, NEW JERSEY, AND CONNECTICUT BENEFIT FROM a WIDE VARIETY OF SERVICES INCLUDING mercury free dental FILLINGS, TREATMENT FOR PERIODONTAL DISEASE, DENTAL BRIDGES, all ceramic dental CROWNS, ONLAYS, VENEERS, IMPLANTS AND IMPLANT RECONSTRUCTION, DENTURES, AND TEETH WHITENING TREATMENTS. HE ALSO SPECIALIZES IN SMILE MAKEOVERS, Dsd digital smile design, CEREC®, FULL MOUTH RESTORATIONS, LASER DENTISTRY, SNORING AND SLEEP APNEA, AND ORTHODONTICS INCLUDING INVISALIGN® AND CLEARCORRECT®. IN ADDITION TO COSMETIC DENTAL PROCEDURES, DR ALVAREZ ALSO PROVIDES AESTHETIC SERVICES INCLUDING BOTOX®, AND DERMAL FILLERS SUCH JUVEDERM®, VOLUMA®, AND OTHERS FOR BOTH LIP AUGMENTATION AND CHEEKS FILLers. Dr alvarez is a new york state certified acupuncturist. Dr. Alvarez is a contributing Author for the huffington Post, and can be found regularly in magazines such as Men's Health, Prevention Magazine, and on Television stations such as Fox in New YOrk and Philadelphia. Dr. alvarez has always seen the importance of technology and digital dentistry in his practice. 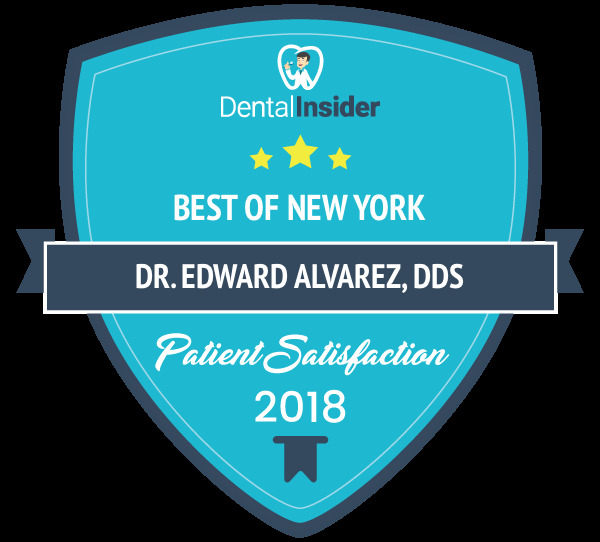 he was one of the first dentists in new york to integrate the Waterlase Dental Laser into his practice in 2003, as well as the Cerec in 2009. dr alvarez currently treats patients with 4 different lasers. He is a Fellow of the World Clinical Laser Institute since 2005 and completed his Advanced Cerec Mastery in 2009. The office is fully digital in everything from cavity detection with instruments such as the carivu and diagnodent, to digital x-rays, and paperless medical records.